When you need to farm it, feed it or build it, Alachua Farm & Lumber in Alachua, FL is here with the supplies. We sell equestrian supplies, livestock supplies, hardware and many lumber varieties. For more detailed information click the links for the product categories below. Alachua Farm & Lumber loves horses and horse lovers. Our equestrian section includes tack and feed, as well as plenty of other items that you might want for your horse such as bridles, bedding, blankets and more. While keeping your horse looking good is important, we know that the number one thing your horse needs is a whole lot of supplies to make sure he stays in top shape. That’s why we have everything you NEED to keep your horse healthy and looking his best. Like we said, we love healthy horses and do what we can to make sure that they have the highest quality food and supplies around. Call us today for delivery information. As the saying goes, “Hay is for horses!” And, boy, do we have plenty of it! Alachua Farm & Lumber is your source for hay. We carry Coastal, Alfalfa, Orchard Alfalfa and Timothy, among others. Feeds include Buckeye, Seminole, Purina FRM, and Total Equine, an extruded feed. For you gardeners out there, we carry bulk seed, sod and fertilizer — whatever you need to suit all your gardening needs. Our shears, pruners, gardening equipment and live vegetable plants will help you to create your ideal garden. With fertilizers, feeders, pest control and pruners — we have too much to list! As always, we deliver everything you need right to your door. From insect repellent to irrigation, we’ve got your farm and garden equipment at Alachua Farm & Lumber. After all, we did start out as a farm supply store, so we’re sure to carry a full line of farming supplies. If you’re in the farming business and need professional-grade items and equipment, such as power tools, bulk seed, sod and fertilizer, you can find them here. We carry dozens of farm supplies from Bekhart, Behlen, Davis, GTO Mighty Mule and more. If it’s fencing that you need, you’ll find a range of styles, including Langdale fence posts as well as Alligator and Red Brand wire fencing. We also rent tools and equipment for those of you who need to tackle special projects. Need to move gravel or a mound of dirt? No problem. Need to do some extensive lawn maintenance that includes core aeration, irrigation installation and bug elimination? No problem. Think of an outdoor project and we’ll give you the resources to make it happen. We’re here to help you make the most of your workdays and weekends. Get those to-dos done so you can go out for some real outdoor fun! Well, “Lumber” is the other part of our name, so it’s no surprise that we specialize in supplying you with only the finest lumber available. For pros and do-it-yourselfers alike, we carry an enormous variety of lumber and hardware. 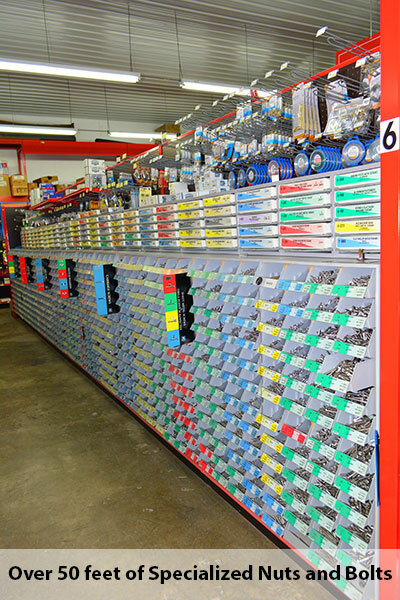 We stock more than 50 feet of specialized nuts and bolts. We also are your complete source for fencing supplies. Cross fences, chain link, picket, post, wood and more — Alachua Farm & Lumber is your one-stop-shop for all your fencing needs. As always, delivery from store to door is available. So go ahead and build that barn you’ve always dreamed about. Get started with a plan, buy the lumber and have it delivered. Then, whip out the hammers, nails, screws, power tools, nail guns and compressor you bought at Alachua Farm & Lumber and start your project. No power? No worries. We also carry generators. Remember, you’ll need roofing, siding, dozens of other electrical supplies, plumbing materials, paint and other building materials. Lucky for you, we’ve got everything you need to help you turn your plan into a reality. In fact, our hardware area is so extensive that we promise you’ll find what you’re looking for. In the rare case where your nut, bolt or screw is not in stock, we’ll order it for you. We know how frustrating it can be to have the perfect project almost completed, but then have just one little missing screw stopping you from finishing it. That’s why we’ll sell you the exact number of nuts and bolts you need — from one to 1,000, if that’s what it takes. We make sure that our nuts and bolts are stainless steel, making them durable and strong. Remember, we’re just like you, which is probably why we’ve accumulated so much darn hardware over the years! Animals are some of our most important family members. We raise and feed ’em like our own kids, and we want to make sure that we give them only the best. 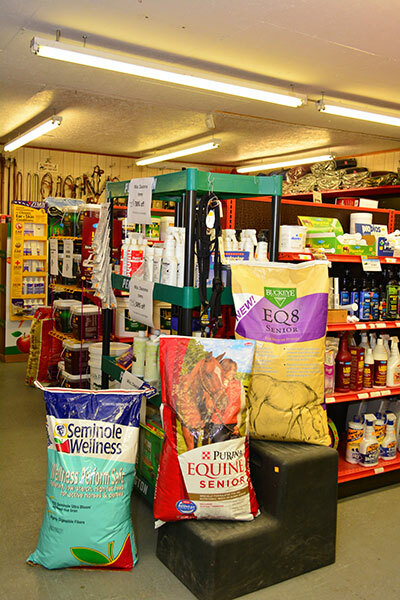 At Alachua Farm & Lumber, we carry only the finest in livestock and pet care items. When you shop at Alachua Farm & Lumber, you can rest assured that you’ll only find the highest quality feed and health care items available. Feed, seed, hay, coop supplies and medical supplies to keep your animals healthy and strong all year long are right here at Alachua Farm & Lumber. For those of you without farms, and even those of you with farms who also have dogs, cats and birds, you know how those little critters hold a special place in our hearts. Bring the kids in and help them pick out a toy or two for the pooch. We guarantee a few licks and possibly a game of fetch when you get home. Make us your one-stop farm supply and lumber retailer today. We are open six days a week.